The time of 4 tweets and founder of Mega delivered a lot of information: the site has reached 100 million files, a recruitment campaign will be launched and a new goal: IPO site within 18 months . 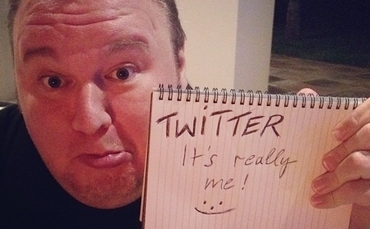 Kim Dotcom not kidding any more, he will take his latest Mega far. It is in any case what it says on Twitter, first tweet in which he wrote that "Mega growth is phenomenal. We expect a preliminary round in the next 6 months, a prelude to an IPO to be completed within 18 months. " For the moment, no information on possible grants and / or shareholders which could bring grist to the mill in the first place. The time is any way to capacity: "We need more servers," writes Kim Schmitz. And to support the growth, "Mega will soon start hiring," writes the boss of Mega. "If you are a developer of the first order, a genius of design or safety, wait for our jobs." Last week, Kim Dotcom named Vikram Kumar, former head of InternetNZ, a non-profit organization activist for free and open internet, as CEO of Mega. "The shareholders of Mega fuel our growth and our legal team." 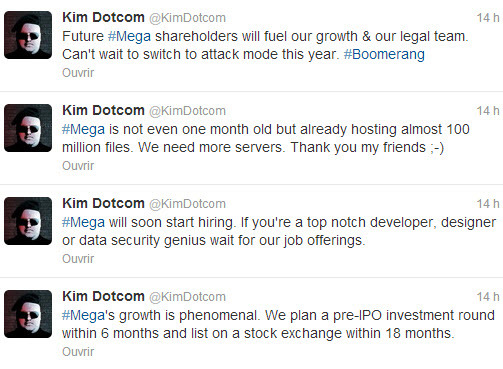 This is how Kim Dotcom finished his series of tweets, a little revenge as he finished his sentence with the word # sharp boomerang.